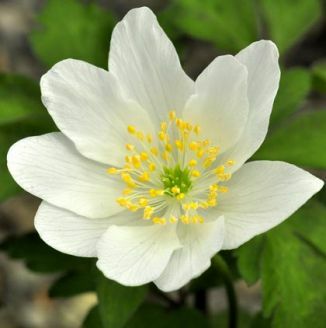 Wood Anemone is not easily confused with other wild plants on this web site. 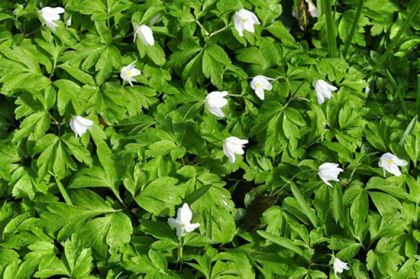 Forming a carpet of green with delicate, white flowers, this perennial wildflower is an early flowering plant which blossoms from March to May. The flowers (2-4cm) have 6-12 hairless sepals which resemble petals, usually white but with a hint of pink beneath. At their centre are very many yellow stamens. They are borne solitarily on long, thin stalks and the leaves are deeply lobed, basal except for a whorl of 3 on the flower stems. This is a plant of deciduous woodlands, flowering before the leaves of the trees above have emerged. It also grows in heather and bracken-covered areas. It is a native plant belonging to the Ranunculaceae family. My first record of this wildflower is from Laragh, Co Wicklow in 1978 and I photographed it in 2008 at Trooperstown, Co Wicklow. Also known as Windflower, Lus na gaoithe (plant of the wind) is so-called for its flexible flower stem which allows the flower-head to bend with the wind.